The last day of October was rather rainy and unpleasant. We drove to Ripoll, which is quite a large town for the area, and did some supermarket shopping. 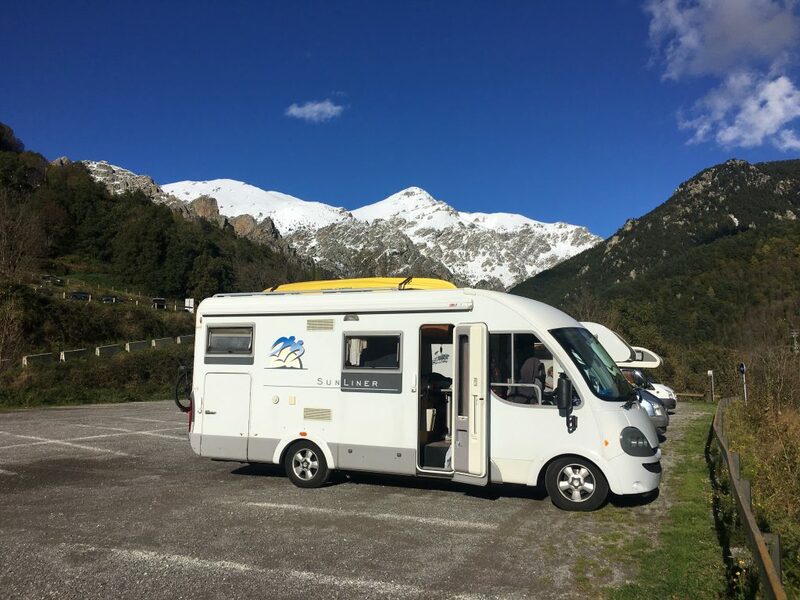 The rest of the day was spent in the motorhome parking in Ripoll – a mixed parking area with a levelled off spot for about 5 motorhomes and a service point. We considered popping out for a wander round the town, but every time we saw a patch of blue sky and thought the weather was clearing out we would be treated to a new deluge. It’s been a long time since we saw this much water running down Bertie’s windscreen. Luckily the rain dissipated overnight so we set off in the morning to Queralbs high up in the Vall de Ribes. We had a little contretemps with the sat nav in Ribes de Freser, where it tried to take us up a cobbled alley. We turned around and used the road signs to find our way through the narrow streets of the town. Queralbs was to be our starting point for a walk to Nuria, a small tourist resort, ski area and pilgrimage destination high up in the valley. No roads rise as far up the valley as Nuria, the only motorised transport is the ‘cremallera’ – a cog railway that runs up and down pretty much all year round (they shut for about three weeks in November). 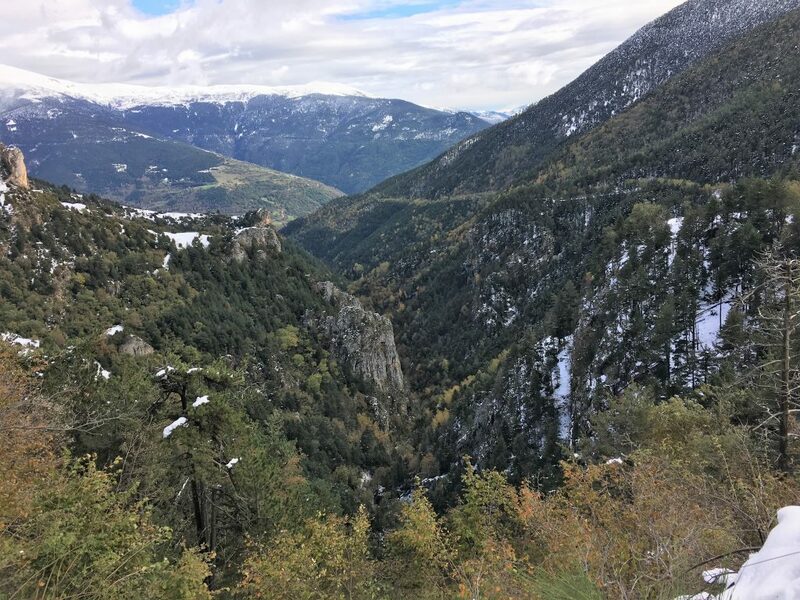 Queralbs is the nearest that you can get in a motorhome and has a large parking area with a specific section for motorhomes although there are no services. Parking is meant to be limited to 24 hours here but we were a bit naughty and ended up staying a little longer. 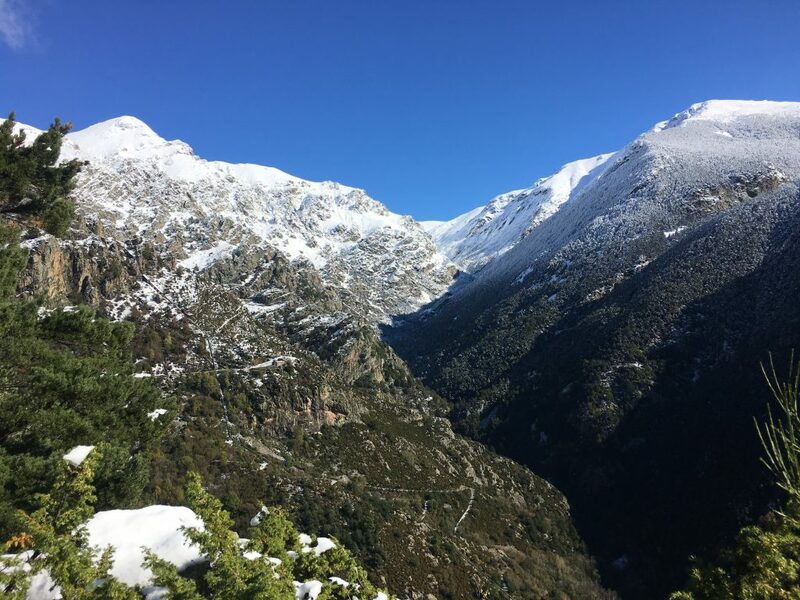 The cremallera starts at Ribes de Freser (where there are two stations) and also stops here in Queralbs before reaching it’s destination in Nuria. 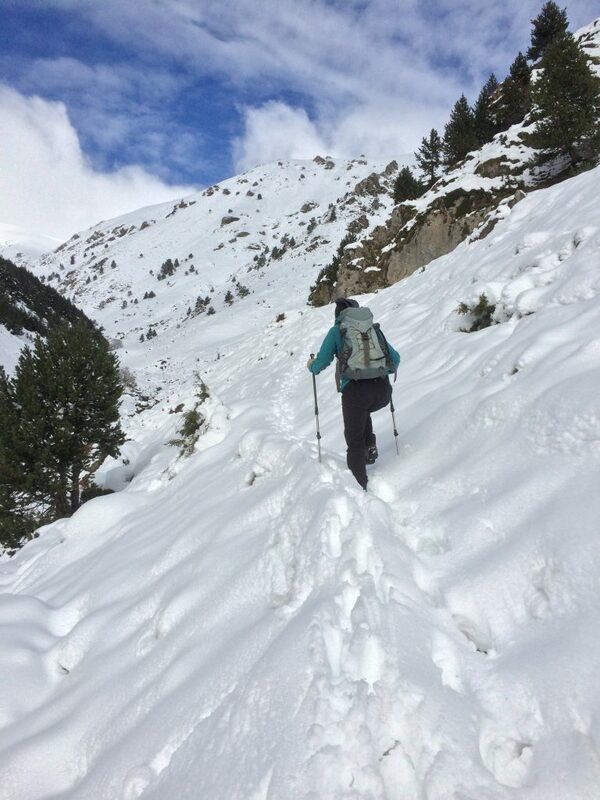 If the snow had not been so thick on the ground we might have taken the train up and followed one of the many trails from Nuria itself, but we knew we weren’t equipped for it today. The 1st of November, All Saints Day, is an important religious and public holiday in Spain. And as it fell on a Thursday this year most schools were closed for both the Thursday and Friday, making it a busy long weekend. In the upper car park people were unloading their cars, preparing themselves for the walk or the train journey in various states of attire. 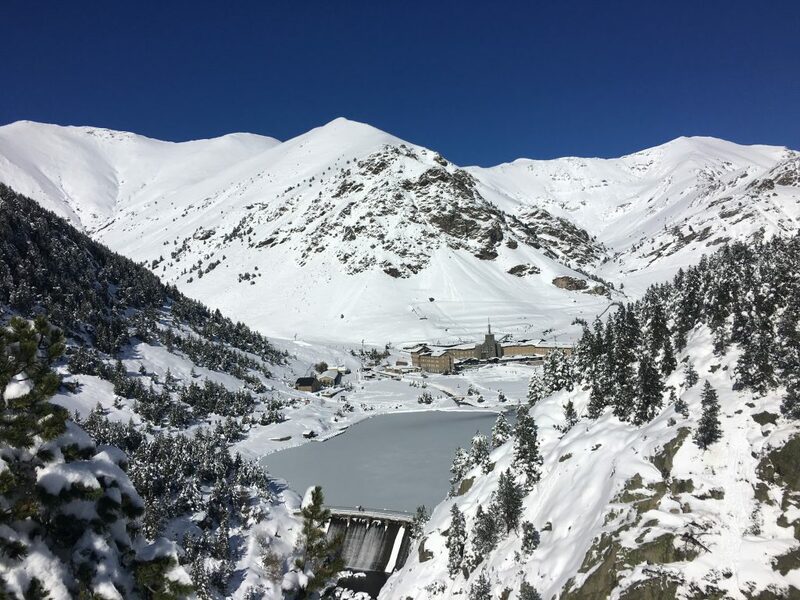 We had looked at the webcams for Nuria and realised it was going to be very snowy, last night’s heavy rain had topped up the snow that had been laid the previous weekend. Typically we were well prepared with rucksacks packed with waterproofs, gloves, hats, food, water and hot drinks plus the ever present map, compass and first aid kit. It seems to be a particular trait of British walkers to anticipate every eventuality, maybe because of our changeable weather. We only saw one other group as heavily laden as us. Mostly people were walking up in sportswear, trainers and carrying a water bottle or maybe a small rucksack. The walk out of Queralbs to Nuria is very well signposted as it is part of the GR11 route. It climbs up from the carpark and over the railway line where you turn left on the road before turning right up some steps (not signposted – just a short cut) and then along cobbles and concrete through the north of village. From that point the path pretty much follows the railway line, with just a couple of other routes are indicated off the main path. 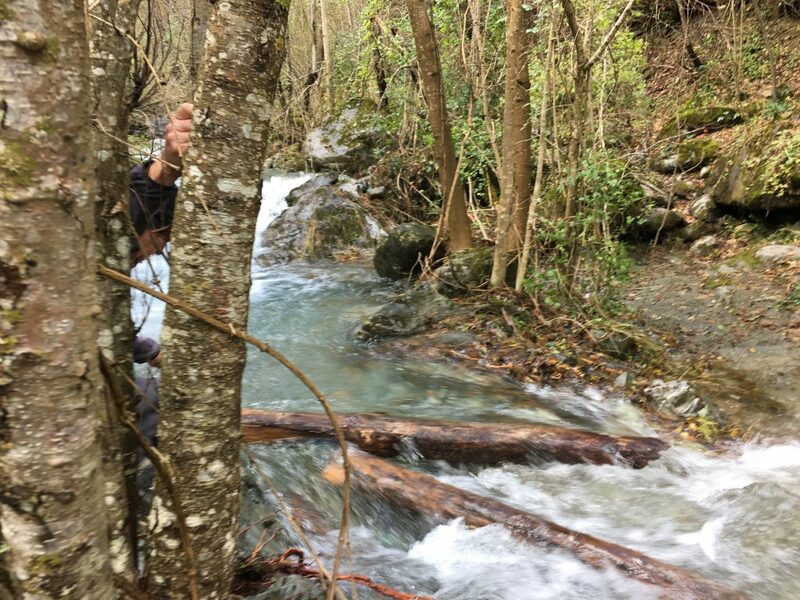 The valley narrows from Queralbs to become a gorge before widening back out again as Nuria is approached, with the dam across the lake being the first sign that you’re almost there. 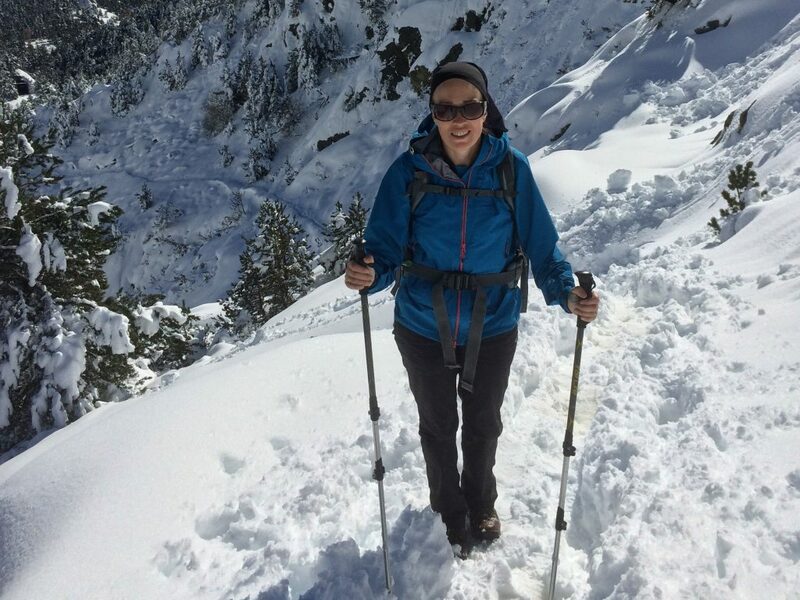 The snow was calf deep by the time we reached the highest point, and the trees were shedding their heavy burden of snow, making me very glad of my waterproof and hood. Three quarters of the way up the path is a small alcove where you can take shelter, we stopped here to have our hot drinks and a lovely Catalan lady (very definitely Catalan and not Spanish) shared her All Saints Day almond treats with us. Pont del Cremal on the route to Nuria – I’ve seen pictures of people bathing here. Not today! The scenery along the walk is spectacular with rocky cliffs, trees and vultures circling overhead. The walk is well worth doing in one direction or the other (or both as we had originally planned), or in the summer you can make longer circular walks. 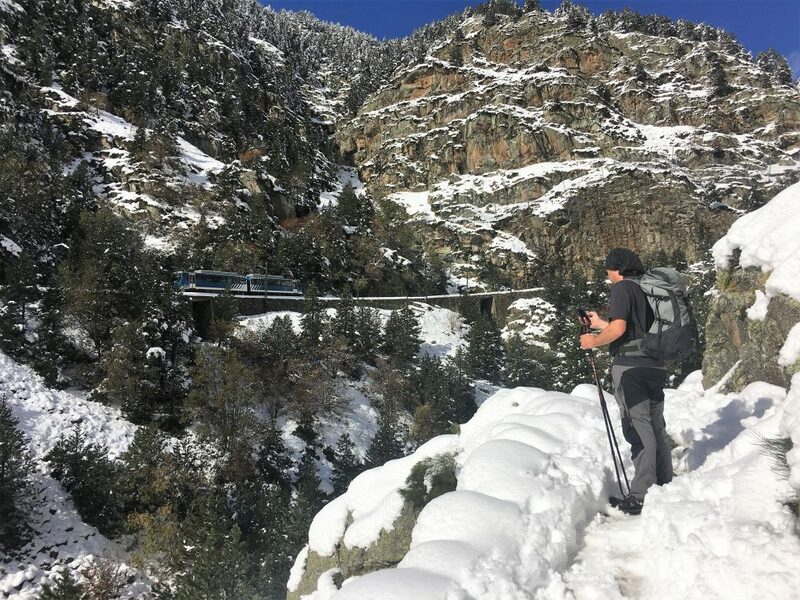 We ended up just doing the walk up, the heavy snow tested the waterproofing of Paul’s boots to their limits and with soaking wet feet he decided he would prefer to take the train down. 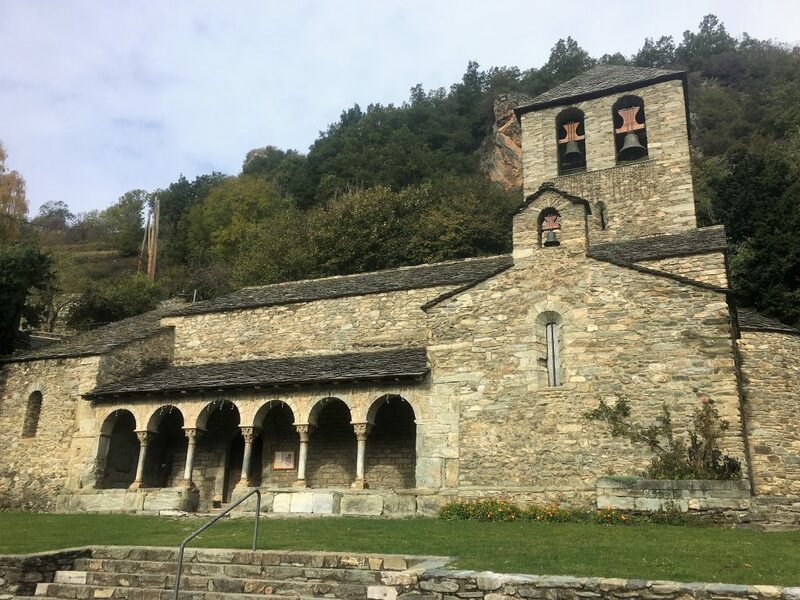 We bought our train tickets in the large hotel and sanctuary complex that makes up the main building in the Nuria valley (there is also the separate chapel of St Gil) and then wandered around watching everyone enjoying their holy holiday. Plenty of people were making religious observances in the sanctuary, but it wasn’t just a solemn day. Families were playing in the snow throwing snowballs and using the bottom of the ski slopes to race their sleds. The gondola was running and although it was very early a few keen people had bought skis with them to make the most of the snow. Other people had snowshoes and were setting off on the walking trails to get to higher points on the mountain. Eventually we crowded into the waiting room to get the next train back down to Queralbs. 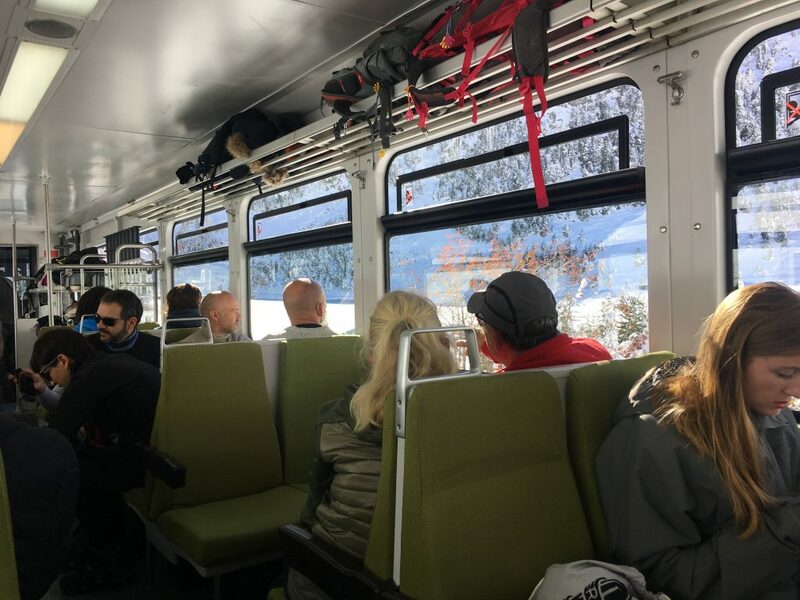 The waiting room may have seemed busy but the train was only half full when we got on and we had a pleasant downhill journey watching the scenery go past in relative warmth and comfort. A short pause on the way down was a mystery, the driver and crew got out and cleared something off the line but we were too far back to see if it was a fallen branch or rock or something else. That night we stayed in Queralbs, braving the overnight cold which was going to be below zero. It was a two duvet night snuggled in Bertie and the gas heating was used for the first time in a while, giving us a blast of warmth before bed and again in the morning. The following day we had decided we would take a walk in the other direction, following the GR11 out of the other side of the village and then (hopefully) managing a circuit along both sides of the Riu de Tosa. A notice board in Queralbs had information about the paths, which went off the bottom of our map. We should have taken a picture. We walked through Queralbs to the south west, following the red and white markers of the GR trail. We passed by the church of Sant Jaume before leaving Queralbs along an overgrown path that was obviously not as popular as the walk to Nuria. This path followed the side of the valley up above the river, crossing farm tracks and rising gently. 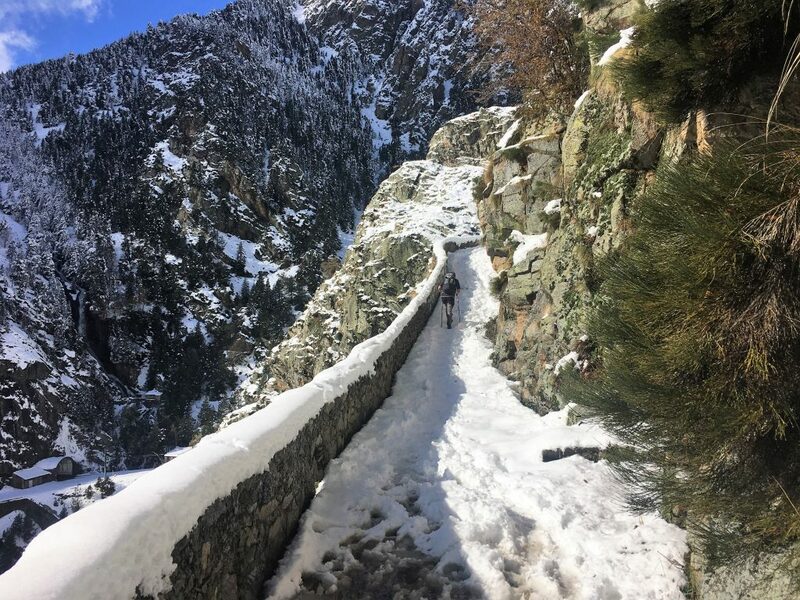 It didn’t take long for snow to appear, mostly slushy stuff on the muddy path and then deeper snow as the path become more rocky. The path wasn’t easy to find as the markers were mostly hidden by the snow, but luckily someone had been there before us and we followed the footsteps of our absent guide with an occasional check against our GPS and every now and again a sigh of relief as we found a clear path marker. About a kilometre from our highest point we wondered whether we should turn around as the snow was as deep as the day before. Paul’s boots had been newly waterproofed though and as his feet were less sodden swe ploughed on, feeling very chipper when we saw the yellow signposts ahead that marked the point where we could cross the river and start back down the other side. Our route on the other side of the river was a track rather than a path. Much easier to follow. Someone had evidently brought their skis up here and descended along the track, we followed their twin tracks through the snow gradually downhill until we reached a signposted junction. We had planned to go left at this junction and descend down into the bottom of the river valley and the miners path, but the descent looked a bit steep, icy and scary. No one had been down before us to convince us it could be done safely. Luckily the signpost offered us an alternative route back to Queralbs and a look at the map suggested it would be a gentler gradient even if it was a lot longer. We opted for this safer route and continued to follow the track. Along the way we bumped into a father and daughter who were looking out for ‘capra’ – the tiny Isards. 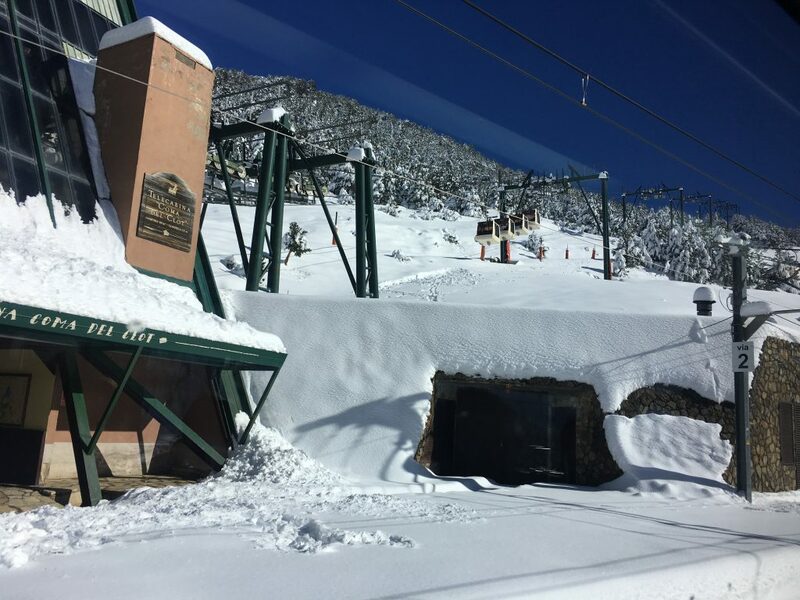 We had to report that all we had seen were hoofprints, but only five minutes later we saw one jumping across the track in front of us. Where the track split we took the left hand fork which took us down through the hamlet of Vilamanya where snow had disappeared and cows grazed in the fields. We continued to follow signs for Queralbs though the fields and woods. 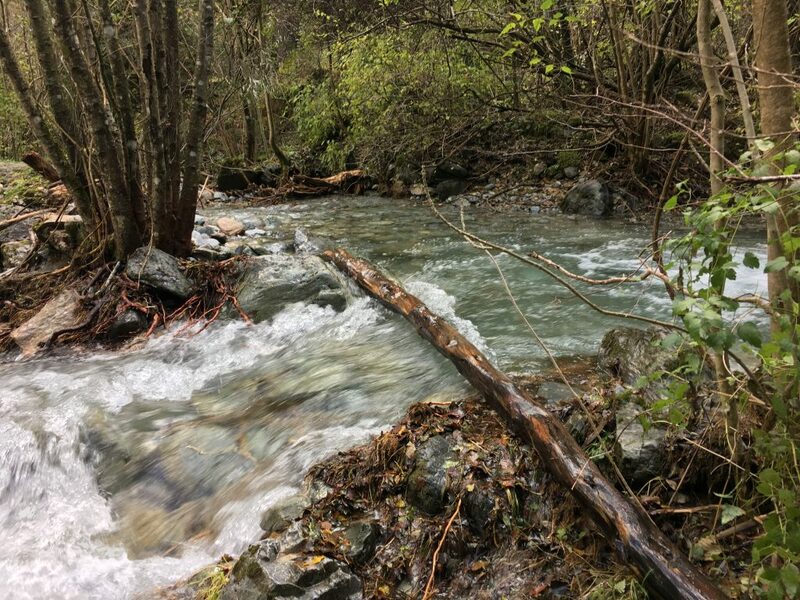 ‘You know we have to cross the river’ I said to Paul as we descended into the valley with the accompanying sound of rushing water, ‘I hope there is a bridge’. There was a bridge, but unfortunately it was no help with crossing the river. The course of the river no longer ran under the stone arch but alongside it, frantic and choked with branches. We didn’t know what to do, the only other option was to descend even further to the main road and then walk the long way up to Queralbs. On the other side of the river another couple were also staring with consternation at the possible options. We exchanged shrugs as we tried and failed to cross and they ended up turning back. 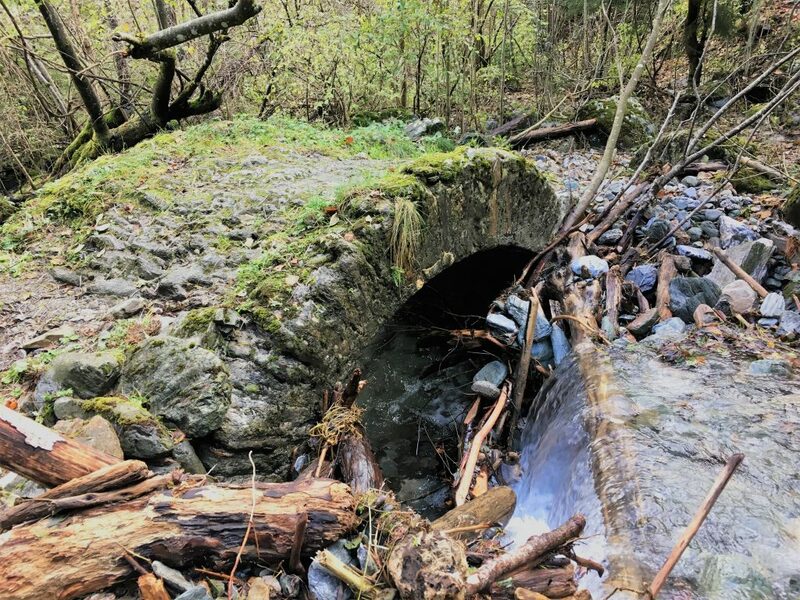 Eventually we made ourselves a makeshift bridge from a couple of logs and crossed with great caution, my heart was beating as if I’d just run up a mountain. 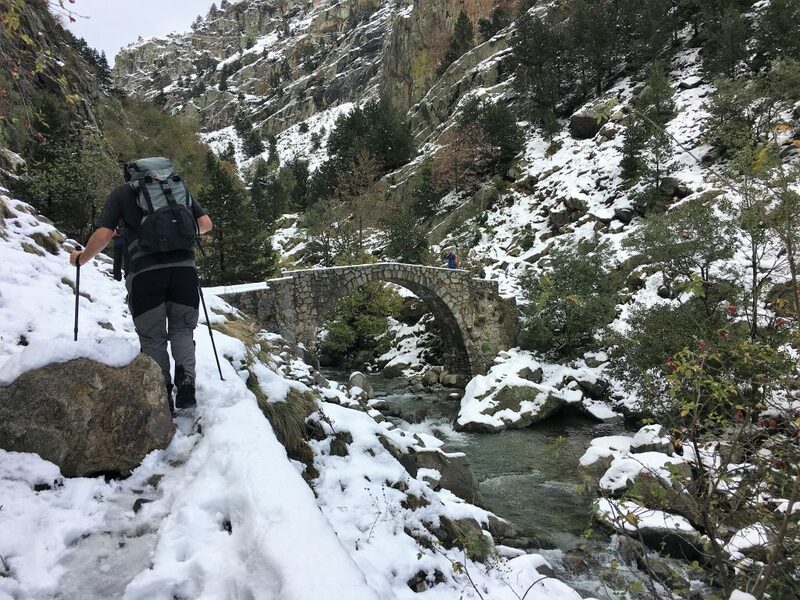 Back in Queralbs we bumped into the couple who we’d spotted trying to cross, they had been trying to take the path down to Ribes de Freser but had now decided to take the train instead of crossing that torrent. They definitely weren’t interested in using our makeshift bridge. 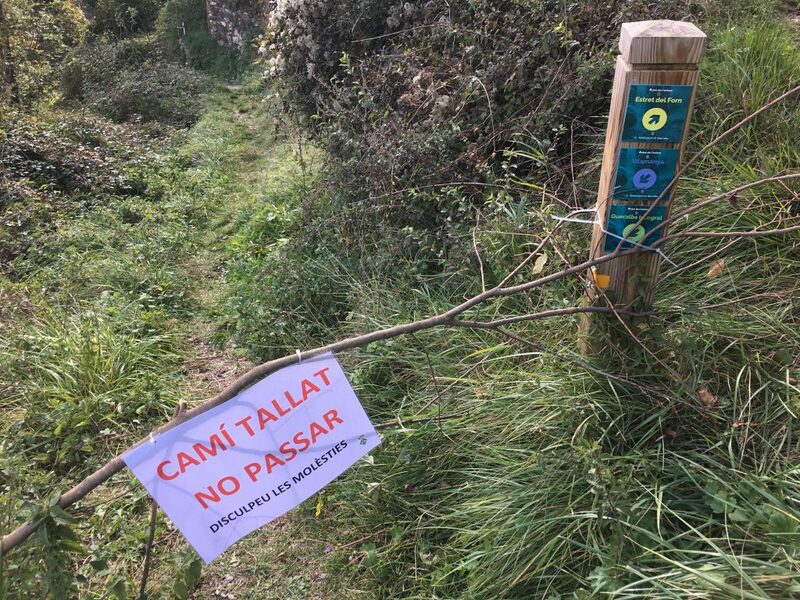 A no entry sign had now been set up across the path which hadn’t been there when they made their descent half an hour previously. A descent and river crossing that they had been assured was ‘ok’ by a couple with a baby who had crossed only a short while earlier! 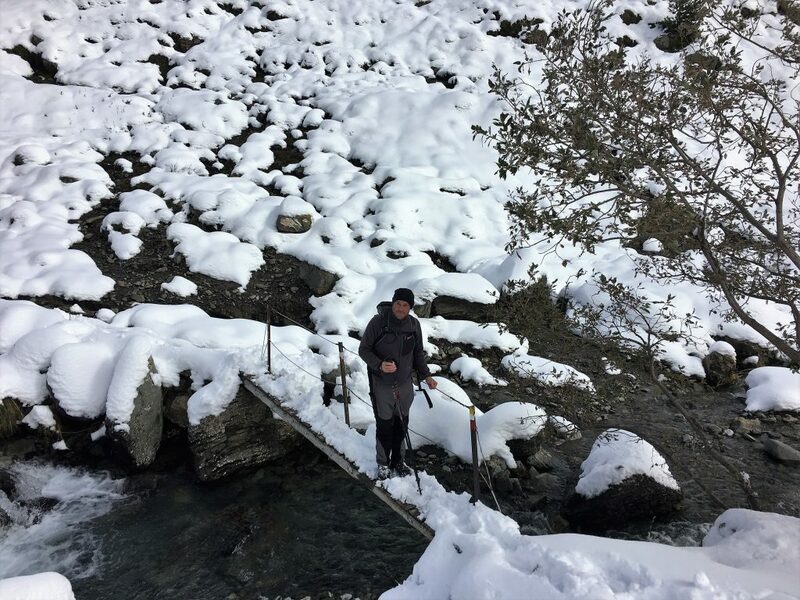 Despite, or perhaps because of, our perilous river crossing it had been a very satisfying day and we were pleased we had actually managed a planned walk without being turned back by snow. I cant wait to get back here in the spring or summer to tackle some of the other trails. That evening we decided to drive back down to Ripoll where the temperatures were a little more comfortable even if there was some overnight road noise. We arrived to find about a dozen motorhomes parked up, all of them Spanish and obviously visiting for the weekend. We were lucky to find a level spot that had just been vacated and spent the rest of the evening people watching and relaxing. 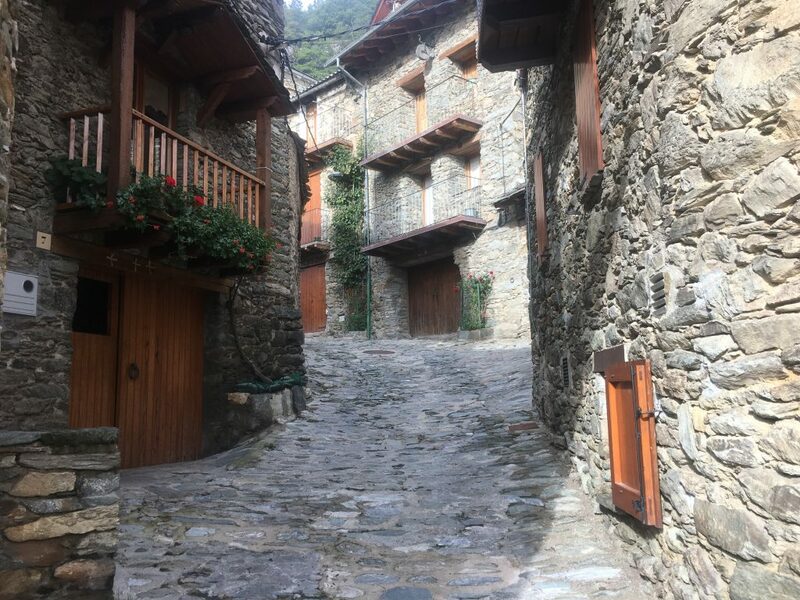 Further Information: this route was partly on the IGN Carte de Randonnees Pyrenees 8, we used the noticeboard in Queralbs centre to determine options for our return. 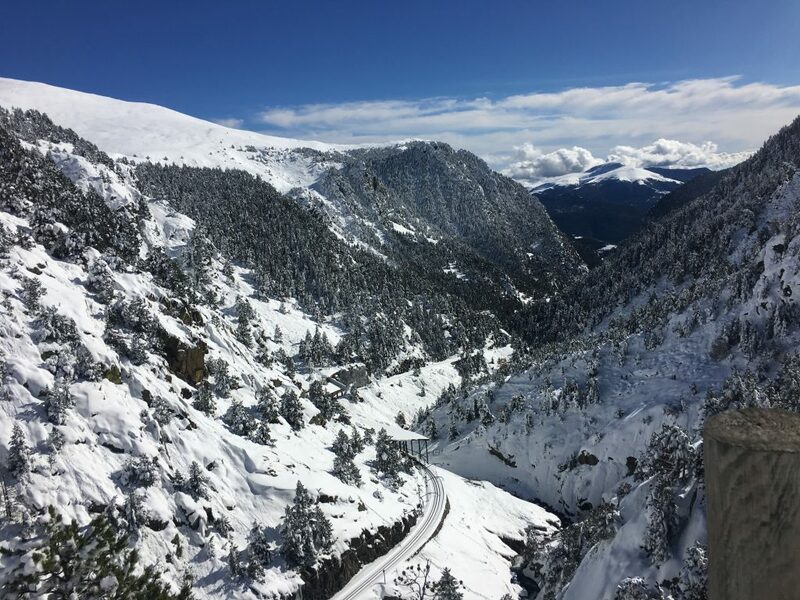 Andorra: Love It or Loath It?